Talks on World Trade Organization (WTO) reform continued this past Thursday, January 24, 2019, in Davos, Switzerland. The “Ottawa Group” of 13 members, chaired by Canada, met on the need to protect and increase the functionality of the organization, focusing particularly on the dispute settlement mechanism and transparency aspects. The United States has objected that the WTO’s existing rules are not adequate to respond to practices of non-market economies (most notably, China). The U.S. points to practices such as failure by countries to comply with transparency obligations to notify government subsidies; the anticompetitive behavior of state-owned enterprises (leading to overcapacity in sectors such as steel and aluminum); and the ability of countries to “self-declare” developing status and maintain exclusions from WTO obligations long after their economic situations have changed for the better. Many WTO members privately agree with these U.S. concerns about the functioning of the WTO. Where they diverge, however, is over the U.S. approach to the WTO’s dispute settlement mechanisms. Over several administrations Washington has expressed concerns about the operation of the Appellate Body, which reviews panels’ findings, prompting the U.S. to block new appointments to the body. Three judges are required to handle cases, and by December 2019 (or earlier, if conflicts of interest arise with any one judge), only two members will remain. As a result, the WTO will be unable after that date to issue binding rulings in trade disputes. The EU, Canada, and others have submitted WTO reform proposals in an effort to respond to U.S. concerns over the Appellate Body’s “overreach” and operation. For example, others have proposed that the Appellate Body refrain from interpreting domestic laws and generally act within its 90 day deadline for reviewing a panel’s findings. They have proposed expanding the number of Appellate Body judges from seven to nine, and for limiting the ability of any judge to serve beyond his or her appointment term. Washington has rejected these proposals, saying that they merely perpetuate the faults of the Appellate Body, and do nothing to correct them. Meanwhile, Washington has not set out its own blueprint for how it wants the WTO dispute settlement system to operate. Greater consensus exists among the Ottawa Group and other WTO members on the need to improve WTO procedures for monitoring and transparency, and the process of notifying members’ trade policies. Some members hope that making progress in such procedural areas will ultimately bring the United States around and ease the way toward reaching greater consensus on the more difficult dispute settlement reforms. It is important to note that the members must reach a consensus in order to make any significant changes to WTO rules. The Group intends to continue talks in May 2019. Safeguard tariffs imposed by U.S. on solar panels and washing machines are first since 2002 steel import restrictions. 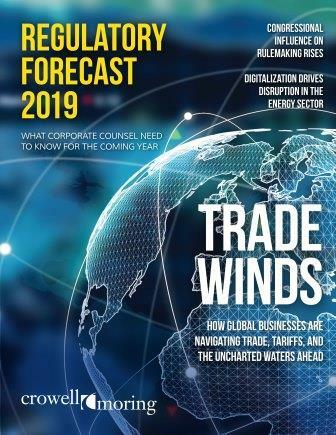 Crowell & Moring's 2019 Regulatory Forecast explores a diverse range of regulatory developments coming out of Washington and other leading regulatory centers of power, and it takes a deep dive into international trade. Click here to access the Forecast. EU Retaliatory Tariffs: Preliminary List Proposed in Continuing Dispute with U.S. over Boeing/Airbus Subsidies. Crowell & Moring is a full-service international law firm that represents major businesses – both public and private – in complex high-stakes litigation, enforcement, regulatory and administrative, transactional matters, and government and internal investigations. Our Trade Law Blog features legal insight and thought-leadership affecting the industries and business reliant and affected by international trade. In a complex global environment, the International Trade Group of Crowell & Moring provides practical, sophisticated advice and cross-disciplinary counsel. Chambers Europe, Chambers USA, Legal 500, The World’s Leading Lawyers Guide, and Best Lawyers have all ranked the firm among the top international trade practices for export control, trade litigation matters (including antidumping, countervailing/antisubsidy, and safeguard matters), and customs.